Becker Florists is still in business. They run this truck every year in the Frontier Days Parade. This photo is from June 2, 2012. 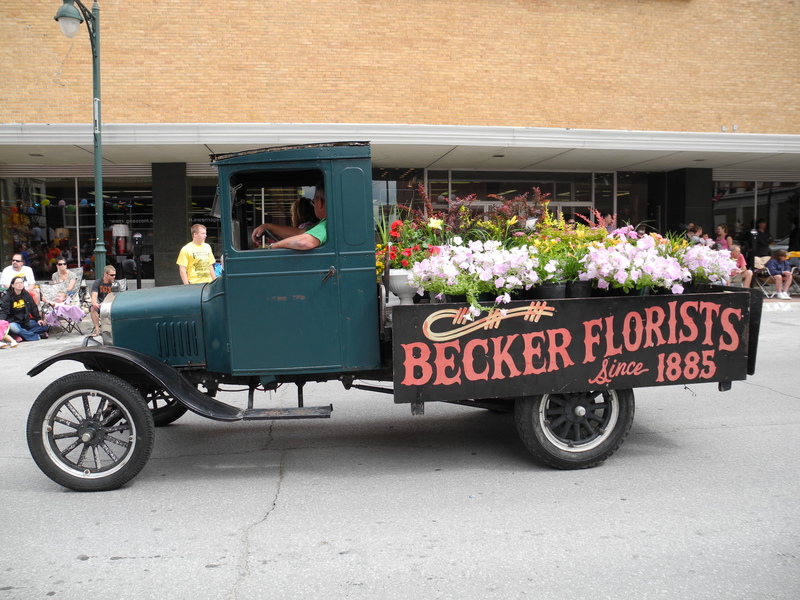 Becker Brothers Have Been in Business Since 1885. Rich River Bottom Land Below Town Furnishes Several Crops a Year and Farm Land East of Town is Also Worked – Ups and Downs. Let the amateur gardner (sic) walk west on First avenue south from Sixth street and down in the valley he will see a sight that will delight his eyes. Laying out in regular rows or planted in solid plots, are many kinds of vegetables. about a block of the rich river bottom land is used for truck farming and supplies many of the people of the city with vegetables. This plot and a ninety acre farm are owned by the Becker brothers, Fred, John and Chris. John Becker tends to the garden on the flats and the other brothers to the farm, on which are raised more vegetables and the ordinary farm products. The ground on the flat is so rich that no attention is paid to the evolution of crop theory but the same kind of vegetable is sown repeatedly. In the farm east of town the land is not so rich, so that care in the planing of the vegetables is necessary. The Becker brothers started operations in the year ’85 (1885) and have continued them in the same place ever since. The place has undergone some improvements, such as tearing down the extensive green houses and building hot beds instead, but beyond that and a few other changes, the place is just the same. All of the early vegetables are started about the fifth of February if the weather permits. If the weather does not permit at that time the gardeners are forced to wait until some time in March. The earlier the stuff is planted the better it is, of course, for the planter’s pocket book. The ground is plowed deep in the fall so as to let the frost get in the earth and pulverize it. As soon as the weather permits the plants are set out and the seed sown. The earliest stuff is planted in the ground on the flat and the late product in the ground east of the city. No fertilizer is needed as the ground is so rich that two or three crops are grown on this piece each year. This entry was posted on Friday, June 8th, 2012 at 6:00 am	and is filed under Business, Farm life. You can follow any responses to this entry through the RSS 2.0 feed. You can skip to the end and leave a response. Pinging is currently not allowed.